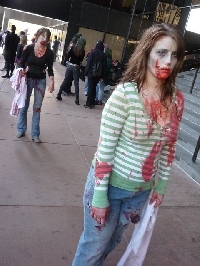 With all this talk of a looming zombie apocalypse, there is lots of advice out there about survival -- how to identify a zombie, what sort of combat training to go through, what weapons you'll need. But, rarely do people stop to think about the mundane, practical things you'll need to know after a hard day of fighting the undead, like how to wash all that blood out of your clothes. Of course, knowing how to thwart blood stains is also useful if your child gets hurt playing sports, or you get a particularly deep paper cut at the office and inadvertently wipe it on your shirt. Regardless, it's safe to say that arming yourself with stain-fighting knowledge is important, pre- or post-apocalypse. One of the first things you need to know about removing blood from clothing is this: never, ever use hot water. Hot or even very warm water will set the stain, making it impossible to remove. Instead, you must first rinse the stain thoroughly with cold water to remove as much of the blood as possible. If the stain is very fresh, you may find that a good flush of cold water, with a little bit of hand-scrubbing, will remove most of the blood all by itself. However, it will probably still show a little pink (especially if the cloth in question was originally white), in which case you'll need to take further steps in your war against hemoglobin. Rub the stain with meat tenderizer. Make a paste out of baking soda and a little water. Rub the paste into the stain, let it set for a few minutes, then apply a little hydrogen peroxide to make the baking soda bubble and loosen the blood. Rinse with cold water. Rub the spot with coarse salt, then follow up with hydrogen peroxide. Soak the cloth in cold water and ammonia overnight. Soak the cloth in milk overnight. Blot the stain with vinegar. Pour club soda over the stain. This method works similarly to the hydrogen peroxide method in that the oxygenated properties of the soda break up and �lift� the stain. In this way, commercial products such as Oxyclean would also work. If the spot in question is a small one (which would mean it's probably not zombie-inflicted, but we won't discriminate here), you can even try removing the stain with a bit of your own saliva. Since blood is a protein-based stain, and saliva is distinctly designed to break down proteins for human digestion, it make sense that it would work to eradicate your little red �problem.� Old wives swear by it. If you are dealing with a large area, or several pieces of bloodied clothing (as might happen after a heated zombie battle), the soaking methods are your best shot. After applying any of these remedies, be sure to rinse the garment thoroughly (in COLD water--always, always cold water) and then launder using laundry detergent as you normally would. Just be certain that the blood stain is really, truly gone before submitting the cloth to any sort of heat (like hot water, your dryer, or a hot iron); otherwise, the stain will be permanent and you'll have no choice but to burn the item or turn it into rags. Remember, even when fighting for the survival of humankind, we can still be clean and presentable.